So we finally have it. 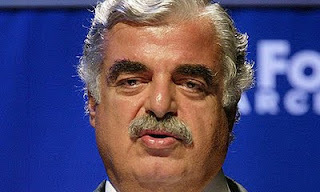 The Special Tribunal for Lebanon’s (STL) indictment in the Hariri murder case has been handed to the Lebanese General Prosecutor Sa’id Mirza. Although the indictment itself has not been made public yet, its contents have been widely leaked in keeping with the STL’s shoddy record. The indictment reportedly names four suspects implicated in the assassination, all members of Hezbollah. The General Prosecutor has thirty days to arrest the suspects before the indictment is made public. The STL’s fondness for delayed gratification is exemplary, an attitude that seems to be shared by Lebanese politicians now. The responses to the indictment so far have been largely evasive, reflecting a lack of eagerness to bring things to a conclusion. Inaction will be the main headline for the foreseeable future. Let’s examine the signs. Firstly, the indictment was handed over while the new cabinet was finalising its ministerial policy statement. The cabinet didn’t seem rattled by this, and subsequently adopted the policy statement maintaining Lebanon’s commitment to the ‘functioning of the STL’ and ‘respecting international resolutions.’ According to one news source, there is a proviso that protects ‘Lebanon’s unity and stability.’ A similar sentiment was expressed by PM Najib Mikati in his speech, saying ‘we will prove those who thought the STL indictment would divide Lebanon and the Lebanese wrong.’ This evidently evasive action by the cabinet reflects its lack of willingness to resolve the STL issue or take any meaningful action about it. Mikati’s balancing act between the demands of the ‘international community’ and his March 8 partners seems to have been made easier by Hezbollah’s reluctance to pressure for stronger action against the STL. In fact, Hezbollah seems to have opted for giving the STL the silent treatment, declaring through sources that it remains ‘unconcerned’ with the STL and that it doesn’t recognise its authority. Quite how that squares with the fact that Hezbollah is represented in the cabinet that included cooperation with the STL in its policy statement is a mystery. The logical explanation however is that Hezbollah and its allies are choosing not to confront the STL issue, leaving the door open for a Lebanese-style patching up exercise. Significantly, the issue of the ‘fake witnesses’ seems to have been withdrawn from circulation, in contrast to Hezbollah’s previous stance of using this issue as a tool to delegitimize the STL. On the other side, March 14’s lack of enthusiasm about the indictment was exemplified by the written statement issued by Saad Hariri’s press office. At a different time, Hariri would have used the occasion to deliver a fiery speech rallying support for the STL and regaining political momentum. Given the political capital that he and his allies invested in the STL, his statement represents a lack of willingness to pursue this path aggressively. In fact, March 14 would have been incapable of enforcing the arrest warrants even when it was in power. Now that it has chosen to be on the outside, it has very little power to push for the enforcement of the arrest warrants. The STL has for long been a symbolic issue for Hariri and his allies, but even a symbolic ‘victory’ seems elusive at the moment. Samir Geagea’s statements effectively confirm this resignation among March 14 ranks. None of this should be surprising, it has been clear for some time now that the STL has become a burden to all sides in Lebanon, but nevertheless an issue that neither side is capable of walking away from or pushing towards a resolution. While the thirty-day period before the indictment is made public is being treated as a stay of execution at the moment, in fact it’s yet another symbolic postponement of an issue that has been central in Lebanese politics for the past six years. We will be treated once again to the spectacle of Lebanese politicians presenting indecisiveness as a virtue. In truth, this clearly reflects how incapable the political class, across the divide, is of solving its problems autonomously.